(Photo shows the FlashJet 2 and base unit) R-Quest's newest automated printer - the TP 5550 & Flash Jet 2, take advatage of the ground breaking R-Quest technology. The TP Series of desktop printing systms provide both stand-alone and network attached printing solution for any sie business. with a 550-disc disc capacity, the TP range provides a flexible way to take full control of printing CDs, DVDs, and Blu-ray discs in-house. The robust, industrial-designed robotics combined with an easy-to-use yet powerful web browser-based user interface that provides the ideal solution to publishing across multiple computer platforms on the same network. Because the system is controlled by R-Quest's TrueNet LX there is no need for client sotware or to install. Publish multi disc products? The TP 5550 & Flash Jet 2 supports CD, DVD an Blu-Ray media! TrueNet LX is the first and only operating system independent browser based publishing solution, without the need for an embedded Windows, Linux, Unix or Mac Server. 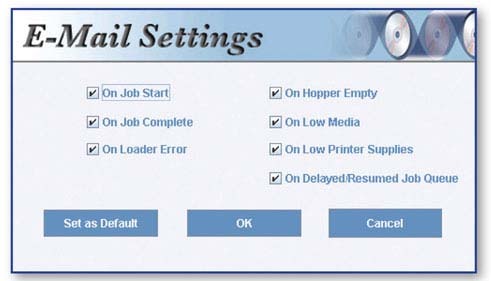 Running inside all major Java-enabled browsers, TrueNet LX eliminates the need to install or maintain any client software or printer drivers on the user's computer. ... even when caused by jobs ahead of yours in the queue!